Over 2,400 youth and adults registered to attend 4-H Exploration Days, which took place June 21–23 at Michigan State University (MSU). This fun MSU pre-college program for youth ages 11–19 is designed to help them develop important skills such as responsibility, independence, accountability, communication, problem-solving and more. Over three days, youth had the opportunity to take classes, navigate campus, stay overnight in dorms, eat in campus cafeterias and take part in activities of their choice. This year, 4-H Exploration days featured some new courses. Laura told us that their new session on making root beer using science, technology, engineering and math skills was a hit. “They were able to make their own root beer to take home and were able to learn about the chemistry behind the brewing process,” Laura said. MSU Extension senior educator Debra Barrett wrote an article about another new, full session that gave youth the opportunity to create a resume and a portfolio for job interviews. Before coming to 4-H Exploration days, youth attended a county orientation to prepare them for their experiences on campus. Kea Norrell-Aitch wrote an article about the new diversity and inclusion activity designed for these orientations this year. Since the event “…attracts such a diverse audience, it was determined county orientations were the perfect platform to incorporate an activity that will provide 4-H members with an opportunity to increase life skills around diversity prior to attending such a large statewide program,” Kea wrote. I’d like to take a moment to thank all of our staff and volunteers for all of your efforts to put together an outstanding and impactful program for Michigan youth. From June 22 to 24, Michigan State University Extension hosted 4-H Exploration Days, a pre-college program annually attended by about 2,500 young people ages 11 to 19 along with chaperones from across Michigan. The program helps youth increase responsibility, confidence, independence and accountability as well as practice problem-solving, decision-making and time-management skills. 4-H Exploration Days attendees have the opportunity to meet new people and exercise communication, teamwork and leadership. The event also inspires them to explore college options and to develop social and academic skills they need for a successful transition to college. This year, campers came from all over Michigan, representing all 83 counties. Youth participated in over 200 sessions ranging from animal science to sports and from business and entrepreneurship to arts and crafts. Outside of sessions, they enjoyed many on-campus activities such as swimming at the IM Sports West outdoor pool, bowling at the Union, ice skating at the Munn Ice Arena, visiting the Abrams Planetarium and lots more. They also attended an entertainment event on Wednesday night, which featured motivational speaker Brandon Lee White. I’d like to thank the hundreds of MSU Extension staff members and 4-H volunteers who made this opportunity possible for our youth. http://www.4-h.org/about/partners/featured/hughesnet/?loc=CAROUSEL. Please help spread the word! In a recent Spotlight, I featured 4-H Exploration Days and the fact that it’s been going on for 44 years. Every year, Michigan State University Extension 4-H Youth Development staff, led by senior program leader Judy Ratkos, put their heads together and think of a theme for the event. And every year since 1984, Marian Reiter, graphic artist in Agriculture and Natural Resources Communications, comes up with a design to go with that theme. Her design is used on the 4-H Exploration Days website, on the activity guide and on the T-shirts that participants, staff and volunteers wear to the event. 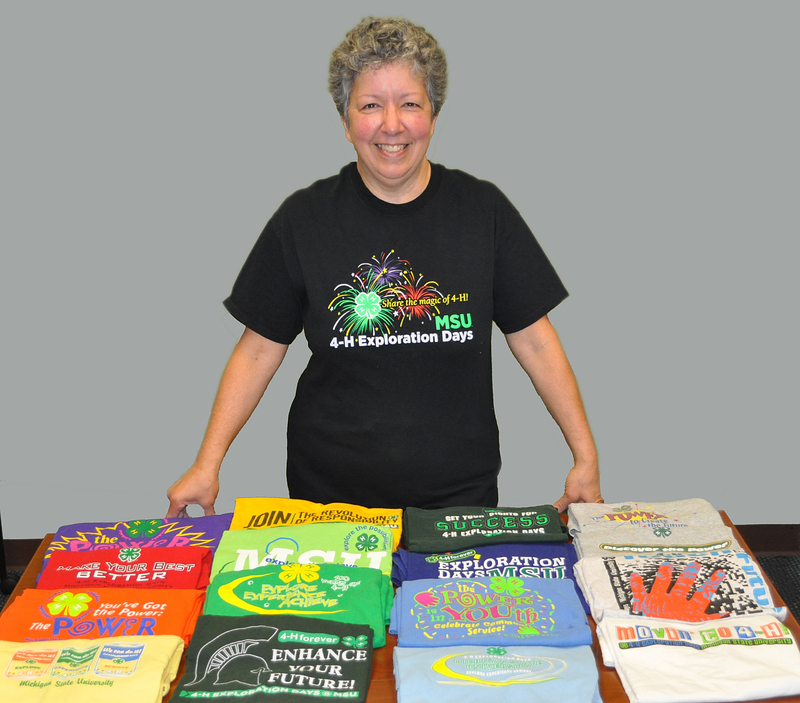 Michigan State University Agriculture and Natural Resources Communications graphic artist Marian Reiter wearing one of her 4-H Exploration Days T-shirt designs, poses in front of some of the many T-shirts she designed for the annual event. Photo taken July 1, 2013, by Caitlin Weathers, MSU ANR Communications. The first 4-H Exploration Days T-shirt she created featured the theme “Prepare for Tomorrow.” This year’s theme was “Share the magic of 4-H!” Marian came up with a design that reflects that theme. The design appears on the cover of the 2013 4-H Exploration Days Activity Guide (click on the link to see the design) and on a black T-shirt that was quite popular with the attendees. So next year, when you see more than 2,000 youth and adults on campus wearing 4-H Exploration Days T-shirts, think of Marian and her creative design expertise. 4-H Exploration Days took place on the Michigan State University campus for the 44th time, June 19‒21. This successful pre-college program is MSU’s largest. More than 2,500 people attended. A little more than 2,000 of those attendees were youth aged 11 to 19 from 77 counties. The event even boasted youth and adult guests from as far away as Poland. When we talk about a pre-college program, we might be thinking of students sitting in desks in the summertime – not something the average kid dreams of as a way to spend a few precious days of summer. But that could hardly describe 4-H Exploration Days. Attendees this year chose from more than 200 sessions. Some sessions focused on animal and veterinary science. Besides taking part in hands-on activities such as exploring the inside of goats and caring for horses’ hooves, attendees took field trips to the various MSU teaching and research centers for horses, dairy cattle and sheep as well as the MSU Veterinary Medical Clinic. Participants also choose from a wealth of other possibilities. They launched rockets, explored emergency service careers at the MSU Fire Station, explored Michigan government and history at the State Capitol and Michigan Historical Museum, and learned about the juvenile justice system. They got creative with sewing and other crafts, writing, singing, dancing, songwriting and performing in theatre. Kids learned to better communicate through sign language, news reporting and public speaking. They delved into entomology, fishing, history, cooking and nutrition. They explored new languages and culture, learned to manage money and studied technology. They got physical with basketball, field hockey, ice skating, running, bowling, archery and volleyball. You get the picture. But just don’t take my word for it. Check out the list of activities here. As you might imagine, it takes a tremendous amount of time, effort and people to put on an event of this magnitude. Nearly 300 served as session instructors or helpers including adult volunteers, teen volunteers, MSU Extension staff (both on- and off-campus) and outside resource people. Many of the adult volunteers and staff doubled as chaperones in addition to the 167 adults who volunteered to attend as chaperones. The event racked up more than 20,000 volunteer hours this year. A special feature this year was the launch of the Samsung Summer Science Program to engage more young people in science and related fields to support future career exploration through inquiry-based science activities. Judy and Extension program leader Jake DeDecker promise to provide more information to counties about this new initiative in the coming month. Congratulations to Gail Hebert, Michigan State University Extension Children and Youth Institute office assistant. Gail is the College of Agriculture and Natural Resources (CANR) Staff Advisory Committee November 2012 Staffer of the Month. The award goes to a member of the CANR support staff who has done something special or noteworthy within their unit or college. Extension senior program leader Judy Ratkos nominated Gail for her efficient, thorough assistance with the coordination of the 4-H pre-college programs 4-H Exploration Days and 4-H Great Lakes & Natural Resources Camp. Gail also takes on the tedious task of formatting participant data for all the 4-H pre-college programs and 4-H seniors and submitting them to MSU Admissions and the National Student Clearinghouse. Her important work accurately tracks college attendance rates of 4-H youth. Thanks to Gail for doing terrific work and to Judy for nominating Gail for this recognition.